Scientists at New York University are studying the behavior of antifreeze molecules that one day can open up applications in the commercial, industrial, and medical fields. Antifreeze proteins (AFP) are naturally occurring proteins that inhibit the formation of ice crystals when water temperature drops to freezing levels. These proteins are usually found in organisms that live in subzero environments such as Antarctica. Certain vertebrates, plants, fungi and bacteria can inhibit the growth and recrystallization of ice in their bodies allowing them to survive in these temperatures. Antifreeze proteins are not the same as automobile antifreeze, ethylene glycol. Ethylene glycol lowers the freezing temperature of water based on the concentration of the chemical in it. Chemists at New York University have discovered a family of anti-freeze molecules that prevent ice formation when water temperatures drop below 32 degrees Fahrenheit.They have reported their findings in the latest issue of the Proceedings of the National Academy of Sciences (PNAS). "The growth and presence of ice can be damaging to everything from our vehicles to food to human tissue, so learning how to control this process would be remarkably beneficial," says co-author Kent Kirshenbaum, an associate professor in NYU's Department of Chemistry. "Our findings reveal how molecules ward off the freezing process and give new insights into how we might apply these principles elsewhere." Preservation of tissues and organs used in medical transplants and transfuion. A common misperception is that water necessarily freezes when temperatures reach 32 degrees Fahrenheit or zero degrees Celsius. Not so, scientists point out. "Nature has its own anti-freeze molecules," explains co-author Michael Ward, chair of NYU's Department of Chemistry. "We simply don't have the details on how they work." To explore this topic, the researchers created artificial, simplified versions of protein molecules that, in nature, inhibit or delay freezing. These molecules were placed in microscopic droplets of water, and ice formation was monitored by video microscopy and X-ray analysis. The experiments allowed the researchers to determine which critical chemical features were required to stymie ice crystallization. Freeze avoidance: The molecules prevent the formation of ice by reducing the temperature at which ice begins to form. This behavior slows down freezing but may be overcome when the temperature gets too cold. The researchers then investigated the molecules' structural features that might explain these capabilities. Their observations showed molecules act as "ice crystallization regulators." 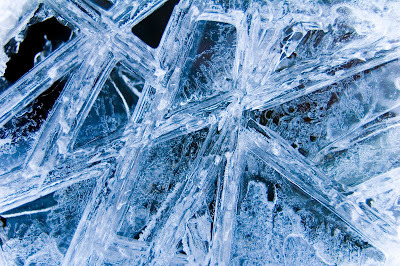 Ice has a crystal structure, and the anti-freeze molecules may associate with these crystal surfaces in ways that inhibit the growth of these crystals, thus delaying or halting the freezing process.